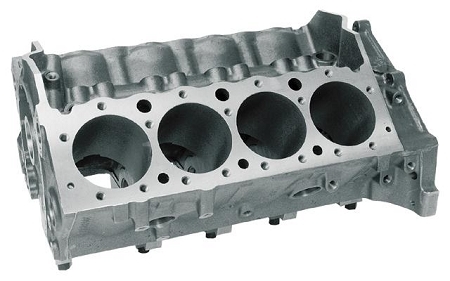 By spreading the cylinder bore centerlines from the standard 4.400” to 4.500”, large bore sizes can be achieved with adequate head gasket sealing space between the cylinders. Bosses are added at the ends of the decks to accommodate two extra head studs, increasing clamping loads and improving gasket sealing. (The extra studs are also provided for in Dart’s new 4.500” bore space cylinder heads). These new blocks are ideal for big inch competition engines. The cam location is raised .391” and oil pan rails are spread .400” per side on both the iron and aluminum blocks, providing lots of room for stroker crankshafts while eliminating the need for fragile small base circle camshafts. Big block cam bearing journals are standard, and 350 or 400 main bearings are available. It is recommended that you contact a Dart technical representative before placing an order for this item. Detailed information about your planned engine build will help to ensure that you choose the right configuration for your motor and that any special parts and considerations are taken into account. 8.850", 9.025", 9.075", 9.325" and 9.500" deck heights allow for greater versatility. 4.500" bore spacing comes with 4.180" bore size standard, larger bores available on request, please call. Big block camshaft bearings allow use of cams with larger base circle diameter to improve strength and rescue twisting with cam driven pumps.